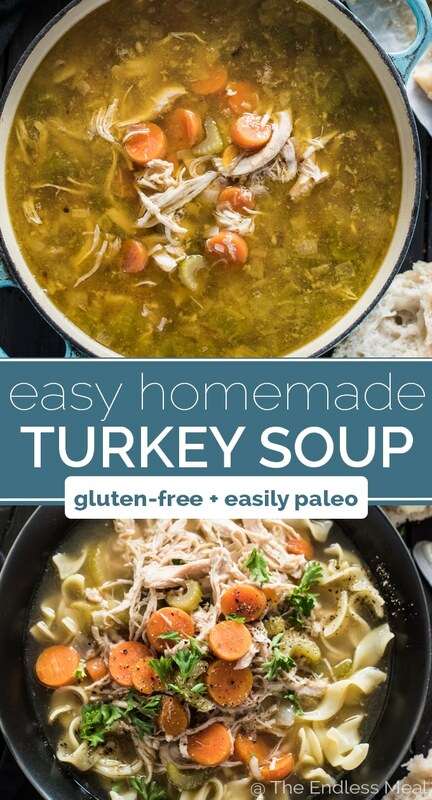 Making Homemade Turkey Soup after your Thanksgiving or Christmas dinner is super easy and a delicious way to use all the leftovers. 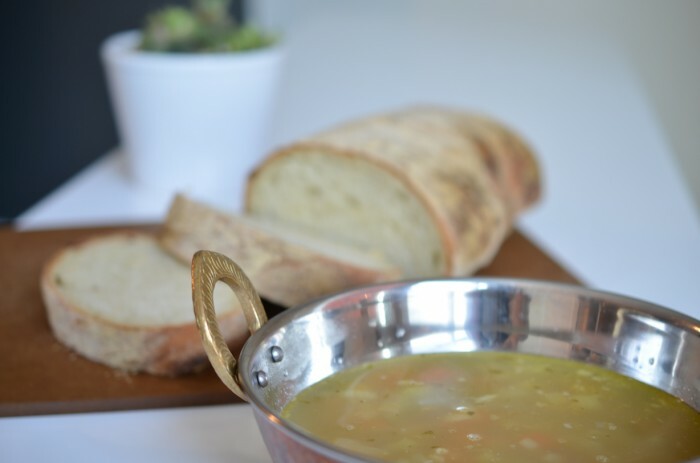 This is the basic, easy homemade turkey soup recipe you remember your mom making. It's delicious! This time we're going back to a recipe that I've made a million times, or once a year since I was probably 19 so not actually anywhere near a million. Sidebar → I think I may have been the only 19 year old on the planet geeky enough to make homemade turkey soup after her Thanksgiving dinner. This post dates back to 2011 and the original recipe was nearly impossible to read. It also used the “c” word more than once. You know the word I'm talking about, right? The thing that turkey bones are actually called but it sounds go gross I don't even want to write it out. Here, I'll say it just once. Carcass. Ewww! Can we agree to never use that word again? The original pictures were almost as bad as the recipe was written. These might be my favorite bad, old pictures. In the first one, it looks like the turkey soup photobombed the picture by jumping into the bottom righthand corner. And there's some random plant in the background cause that makes so much sense. What was I thinking? I hid the picture in the middle of the post. Promise me you'll scroll down to have a laugh?! Enough about poorly written recipes and funny pictures, let's talk about this soup. This soup is 90% about the delicious homemade turkey stock. You could drink the stock on its own it's so good. It's also ridiculously easy to make. All you're going to do is remove as much of the meat as you can, break the bones into a few pieces so that they fit in your largest pot or crockpot, then fill with water. 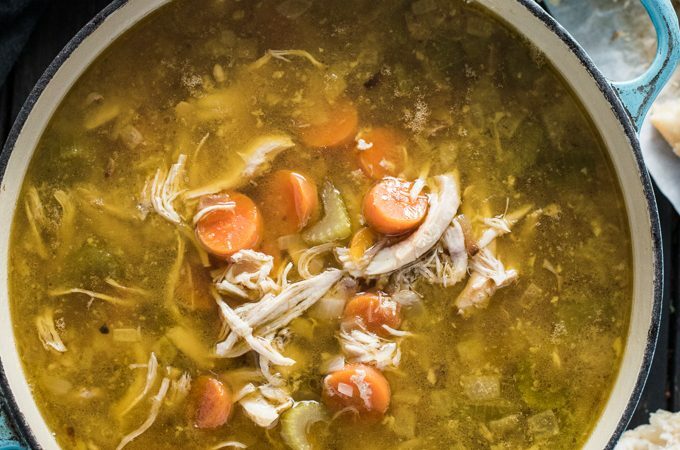 You'll super slow simmer the stock overnight and wake up to the most amazing smelling home and a pot of tasty turkey broth. You'll notice that I don't add anything other than the turkey bones to the pot. I've made it plenty of times by adding different herbs, peppercorns, onions, carrots, etc. but I don't notice a major difference in flavor at the end so I've stopped doing that. The roasted turkey is all the flavor you need. You can either make the soup right away from the turkey stock, or you can refrigerate it for up to 3 days, or freeze it for at least 3 months. 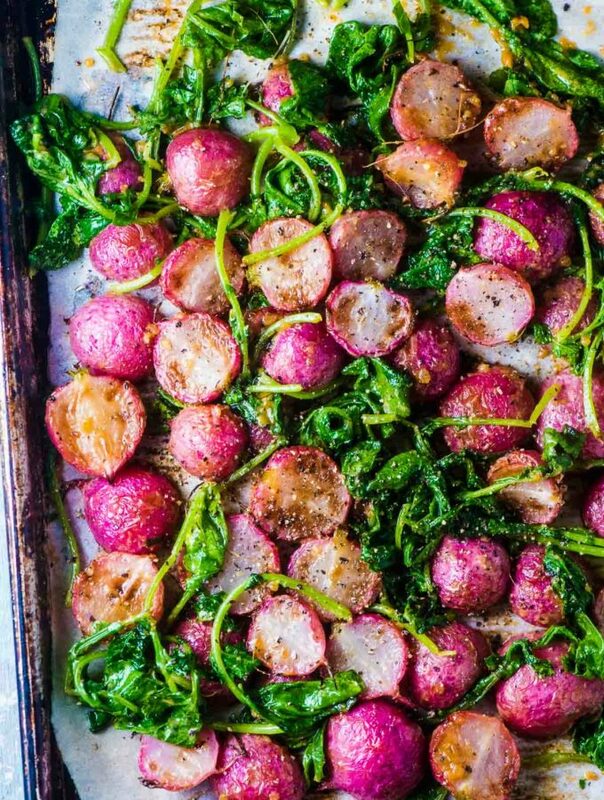 Butter up some bread and dig in! Do you ever look at the turkey as you're putting it into the roasting pan, long before all your friends and family show up, and think, “I'm going to be eating turkey sandwiches for breakfast, lunch, and dinner every day for the next week”? I think this every year, but thankfully my friends are not light eaters. I had 15 people over for dinner this year and roasted a 17-pound bird, all but a few scraps are gone. We ate over a pound of meat plus all (and there were a lot) of fixings and dessert. That's not a small feat. I'm happy to not eat turkey sandwiches all week long. I was able to make one sandwich, plus prepare a whole pot of homemade turkey soup. Homemade turkey soup, is my third favorite thing about turkey dinners, after the dinner itself taking first place and sandwiches second. While coming in third place out of only three possible spots isn't exactly winning any prizes, do know that I really do like turkey soup. There's a sense of warmth and comfort about sitting down to a bowl of hot soup on a cool autumn day that is trumped only by knowing you made it from scratch. And here's the other great thing about it: it's super easy to make! And after all the work that goes into preparing a turkey dinner, easy is what I'm looking for. The recipe goes something like this: grab your biggest pot, throw in the turkey bones and fill the pot with water. Simmer. Keep simmering. Strain. Sauté some onions, carrots, and celery, add the turkey broth you just made and some leftover turkey meat. Serve, preferably with a crusty piece of well-buttered bread. The recipe below is how I typically make homemade turkey soup. I didn't have any carrots on hand this year and I didn't feel like going out to get some, so I left them out. (I remembered them this time around. Yay me!) If you choose to add egg noodles and turn this recipe into a homemade turkey noodle soup, cook them separately and add them to each bowl of soup to prevent them from getting over-cooked and mushy. If you'd rather have a homemade turkey vegetable soup, or you eat paleo or Whole30, simply leave the noodles out. Remove all of the meat from the turkey and reserve 3 cups for the soup. If you've cooked your stuffing in the turkey, make sure to remove it all. Strain the turkey stock through a colander into a large bowl and discard the solids. Strain once more through a fine mesh sieve. You can either use the turkey stock immediately or let it cool and refrigerate it for up to 3 days or freeze it for up to 3 months. Heat the olive oil in a large pot over medium-high heat. Add the onion and cook for 5 minutes. Add the carrot and cook until it begins to brown in a few places, about 5 minutes. Add the celery, turkey stock, and the reserved turkey meat to the pot and bring to a boil. Simmer for 5 minutes, or until the carrots and celery are soft. 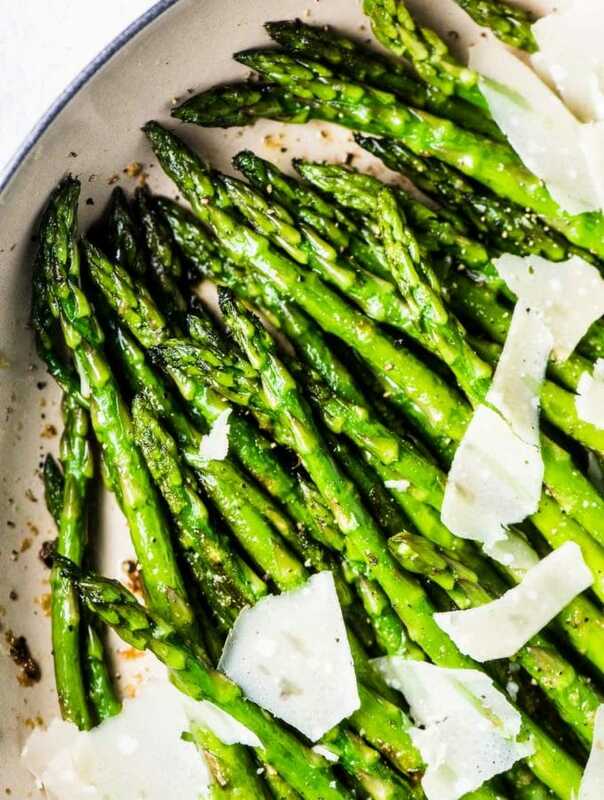 Season to taste generously with sea salt. If you're using the egg noodles, add them cooked to your soup bowl, ladle in the soup, and garnish with a little sprinkle of parsley. If you'd like to use your crockpot to make the turkey stock, put all the bones in, fill with water, and set the timer for 8-10 hours. I like to do this while I'm cleaning up from dinner so I don't have to store the bones. Here's a link to the full Crockpot Turkey Stock recipe. 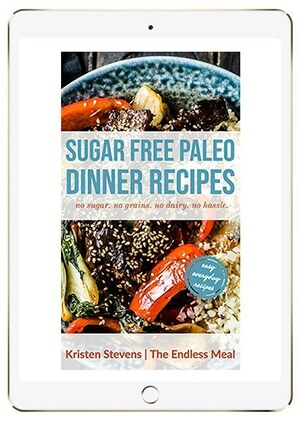 I've placed this recipe in the Whole30, paleo, and gluten-free categories. If you follow any of these diets, make sure to not add the optional egg noodles. The soup is delicious without them, too. If you don't have a lot of turkey meat left, you can substitute chicken. Simmer 2 chicken breasts in 1 cup of turkey stock for 30 minutes then shred them with 2 forks. Please don't recreate this recipe using store-bought stock, the flavor in this recipe is all about the delicious homemade stock. No idea how much noodles to use! Am I not reading thoroughly enough? You should come inhale the aroma!!! Doing this soup now. It smells amazing, doesn’t it?!! I made this soup today. It is delicious. Beyond yummy. I added green peas on the second round. Only vegetables was carrots, chopped celery then the peas. A light sprinkle of salt. I’m a bachelor that drinks then wants to eat noodle soup so what I do is freeze the soup in 500ml. containers 3/4″ full then when frozen add the al dente prepped no yoke egg noodles on top of the frozen soup and freeze. To reheat simply run hot water on the plastic container, dump it in a glass bowl & nuke it. Also I love turkey drums & buy them on $1.49 day (a pound) 10-20 at a time, peel back the skin and season the meat with turkey rub, pull the skin back up & roast 2 trays at a time, freeze and eat them individually with a meal, save the bones for stock. When making stock I use my vise in my shop to crush the bones, simmer with a stove top defuser to get a low temp for up to 36 hours mashing the bones down periodically. The stock I get is awesome, so rich in marrow that it is a meal in itself, never mind the soup it makes. I Don’t waste the drippings either, I make 1 quart of gravy, pour into ice cube trays,freeze to use individually on potatoes & veggies when eating the drums as a meal. That’s a really great idea to freeze the egg noodles on top of the frozen soup!!! I don’t have the turkey carcass, but do have wings and one drumstick. Is this enough to make turkey stock? Yep! Just put them in a pot and cover them with about 2 inches of water. It’ll make enough for some soup! I made this with our leftover Thanksgiving turkey and it was perfect. Loved the addition of the noodles. Will make it again after Christmas! I’m so happy to hear you liked it! Happy Thanksgiving!! You are not the only 19-yr-old geeky enough to make home made turkey soup. Still making the family recipe since high school , but thought this year as the family monarch at 47, I’d look for somethIng new. Thanks for sharing. We must be kindred spirits! Hope you had a great Thanksgiving! My turkey carcass is in the freezer waiting patiently to be turned into stock for soup. Yours looks great, and I can’t wait to make some! i like your food pictures and want to invite you to try out tastingspot.com. it’s for anyone that just wants another place to submit photos and share it will other foodies. It’s still in beta version, but would love for you to start adding some photos and help get it going. I’m always looking for high quality sites to post to. I’ll definitely make a contribution to yours. Thanks for letting me know about it!